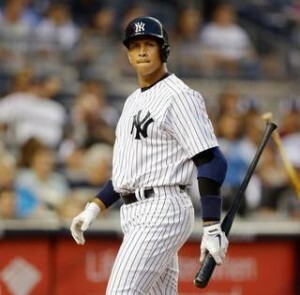 The Alex Rodriguez era in New York will officially end on August 12th. It wasn’t supposed to end this way. Rather than completing his career in a generally meaningless game on a Friday night in August, Alex Rodriguez was supposed to exit either with a dramatic World Series performance or after eclipsing the “bogus” home run record of a disgraced cheater. Instead, following a hastened Sunday morning press conference, Rodriguez will serve on the active roster for the Yankees only through August 12th before being released. While there is still a chance that he will be picked up by another team, the fact that he is still owed more than $25 million dollars over the next year means he will likely instead move to an advisor role with the Yankees. It seems like forever ago, but it has actually only been eight years (2008) since Rodriguez was seen by most in baseball as the savior who would free the game from the purgatory of having Barry Bonds and his chemically supported body at the top of the prestigious career home run list. Of course, we all know about his dramatic fall from grace. It started with a Sports Illustrated article and a somewhat confusing explanation in 2009 where Rodriguez admitted to taking PEDs given to him by a relative while with the Texas Rangers, but insisted it was a short-term thing and hadn’t significantly enhanced his performance. While his explanation was hard for some to accept, for the most part people (most particularly Yankee fans) took it hook line and sinker. Especially when he overcame past playoff failures and helped lead the Yankees to a World Series title in 2009. Interestingly, while Rodriguez still showed above average power for the next couple seasons, he never again hit .300 for a season (something he had done nine times between 1995 and 2008). He also started regularly missing time with injuries starting in 2009. After reaching 30 home runs and 100+ RBI in 2009 and 2010, from 2011-2013 Rodriguez played in only 265 games (out of 486) and totaled only 41 home runs and 138 RBI in three years. During this time, his insistence that using PEDs was not a regular part of his career also came into question as he was prominently mentioned in the investigation of the Biogenesis lab in Miami. 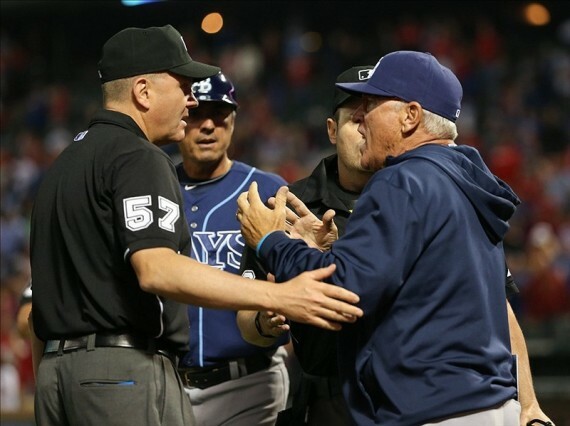 It was his inclusion and supposed attempt to cover up his involvement that resulted in Major League Baseball coming down with a historic suspension that ultimately saw Rodriguez miss the entire 2014 season. Despite some wondering whether the Yankees would want him back, the fact that they owed him $65 million guaranteed that he would return. Despite hitting 86 home runs the last two seasons, Chris Davis is still one of the most underrated players in baseball. Several major league baseball teams spent the winter spending money like a drunken sailor in hopes of moving to the top of the league. Yet, as we prepare for the 2014 season the teams expected by many to contend are a combination of big money and middle payroll teams. For now, the Los Angeles Dodgers have surpassed the New York Yankees as the team with baseball’s highest payroll. However, that doesn’t mean the team in the Bronx is suddenly being frugal. The suspension of Alex Rodriguez hacked a large salary off their payroll, but the Yankees made up for that by signing Japanese pitching star Masahiro Tanaka and high money free agents Jacoby Ellsbury, Carlos Beltran and Brian McCann. While several teams in recent years have been able to make the playoffs without high payrolls, once the playoffs begin the higher payrolls have generally had an advantage. That was quite obvious last season in the two playoff series that went to a decisive game. The higher payroll Cardinals and Tigers each started a seasoned veteran in the fifth game of their division round playoff series (Adam Wainwright and Justin Verlander, respectively). Their opponents, the Pirates and A’s, each started a rookie who wasn’t even in the major leagues when the 2013 season started. Having a high payroll is no guarantee that a team will make the playoffs, but big off-season spending has certainly put several teams in a position to contend. 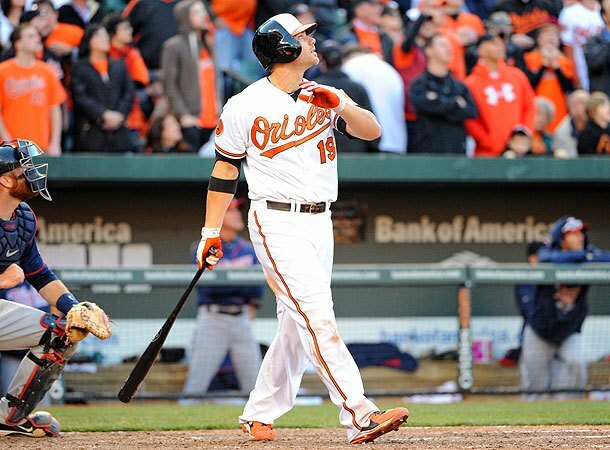 In the last two seasons Baltimore Orioles slugger Chris Davis has hit 86 home runs, driven in 223 runs and scored 178 runs, yet ESPN’s recent player rankings didn’t have him listed among the top 25 players in the game. The Sybermetrics disciples have become so enamored with WAR and other made-up stats that they have forgotten that driving in and scoring runs is the name of the game. As a team, the Orioles have been generally dismissed despite having two consecutive solid seasons, but they have a very potent offensive and if David has another strong season the O’s could again be in contention throughout the season. 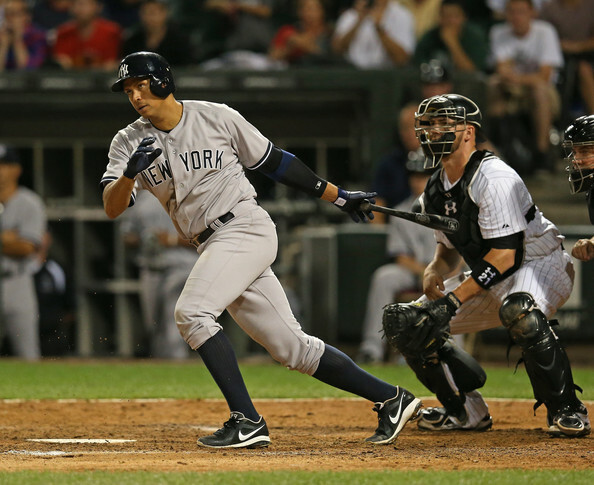 Alex Rodriguez has struggled in his return to the field. For all who simply want to talk more sports, the Alex Rodriguez debacle has not been good. Since the one-time sure Hall of Famer has become the latest poster child for the PED era in baseball, performance on the field of play has been overshadowed by the growing circus off the diamond. It is hard to believe that just five years ago Rodriguez was seen as the savior who would save the baseball world from the “tainted” star who “stole” the home run record from Hank Aaron. Now, Rodriguez is quickly replacing Barry Bonds and former pitcher Roger Clemens as the face of the steroids era. 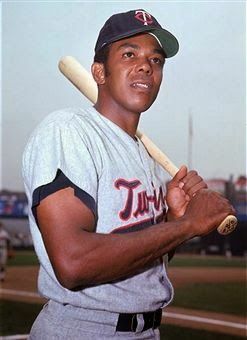 Where once he was pointed out as the prototype for the 21st Century baseball star, there now seems to be enough doubt to wonder if Rodriguez was instead the 21st Century version of a test tube star. In recent weeks some have wondered if even the young Alex Rodriguez who emerged as a star at the age of 20 with the Seattle Mariners could have been enhanced through artificial means. In hindsight, it could be considered a little fishy that Rodriguez hit .232 with five home runs and 19 RBI in 149 at bats in 1995 and then the following year won the AL batting title with a .358 average, 36 home runs and 125 RBI. Officials in any sport can turn into an enemy of the state with one blown call. Umpire Mike Everitt will not be able to step into Tampa, Florida after this HORRIFIC strike three call to end the Rays-Rangers game. The call was so mind boggling that the Rangers pitcher, Joe Nathan even said “WOW”. Time to check those bi-focals ump! Oh he did say he was sorry…. Tip Of The Cap To GameDayR! A blown umpire call let the St. Louis Cardinals get away with a major blunder in the eighth inning on their way to defeating the Atlanta Braves in the Wild Card Playoff Game. Even after nearly eight hours of baseball, one of the worst calls in playoff history, uneven play by every team and victories by the two road teams, it is still hard to know exactly what to make of the first “Wild Card Day” in Major League Baseball history. Since in the old playoff system the Orioles and Rangers, who were tied with records of 93-69, would have been meeting in a one-game playoff, there really was just one game that was added to the playoff schedule in the new format. And while there was some excitement, there was also controversy and ultimately a team having their season end in a one game showdown despite finishing six games better than the other team during the 162 game regular season. For the Atlanta Braves, it marks the second straight year that they have been edged out of a trip to the LDS by the St. Louis Cardinals. 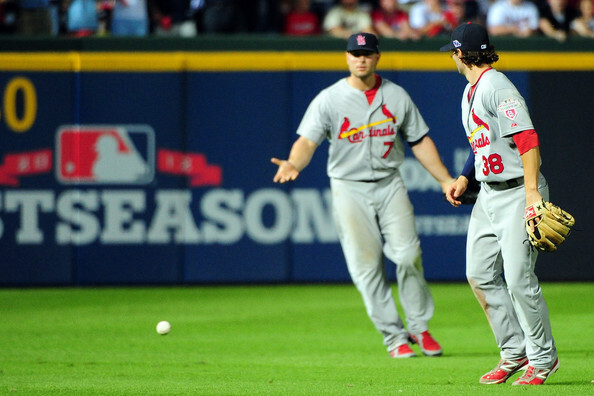 However, unlike in 2011 when the Cardinals used a month-long Braves collapse to sneak ahead of them in the standings, this time they did it with a head-to-head wild card victory. Some have used the awful infield fly call in the eighth inning as justification as to why you need more than a one game “winner take all” playoff to determine which team will advance. The thinking being that over time breaks even out and seasons shouldn’t be decided on one questionable call. 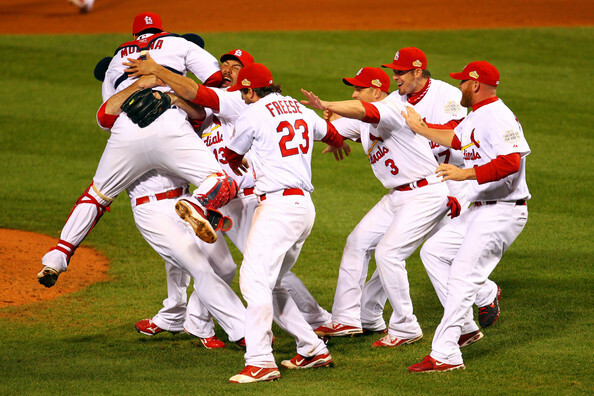 An improbable season ended with the St. Louis Cardinals as the 2011 World Series Champions. The 2011 St. Louis Cardinals are a perfect reminder that in sports it isn’t how you start, it is about how you finish. Considering that they lost their best pitcher to injury before the season even began and with just six weeks left were 10.5 games behind in the Wild Card race, it is quite amazing that last night they claimed the 11th World Series Championship in team history. Even in the World Series they seemingly had an insurmountable mountain to climb as they were twice down to their final strike before rallying for an improbably extra inning victory in game six. Then in the decisive seventh game they trailed early, but scored the final six runs to defeat the favored Texas Rangers. Since Tony Larussa became manager of the Cardinals in 1996, the team has had their greatest success in seasons when they weren’t given much of a chance. The 90-72 record that St. Louis posted in 2011 was actually the seventh best single season total for the franchise during Larussa’s tenure. Yet, the only other World Series title the team has earned came in 2006 when the team won only 83 games. The Cardinals finished the 2011 season winning 24 of their final 33 games to sneak into the playoffs on the final day of the season.